The numbers say that these should be the best of times for America. The economy has been growing for five years. Unemployment is low. Inflation is almost nonexistent and gas is cheap. Yet many Americans feel deeply uneasy about their future prospects. Uncertainty is the catchword of the moment. This uncertainty is contributing to growing pessimism and anger -- discontent that is no doubt a factor in the unsettled state of the 2016 presidential race. In a 2013 article at Oil-Price.net, written prior to the beginning of the 2014 collapse in oil price, I proposed that turbulence in the oil markets was on the way. In a subsequent essay in early 2015, I suggested that this instability in the oil markets would lead to a period of turmoil in the stock market in the coming year or so. There was no magic behind correctly foreseeing what unfolded in the oil and stock markets over the last two years. 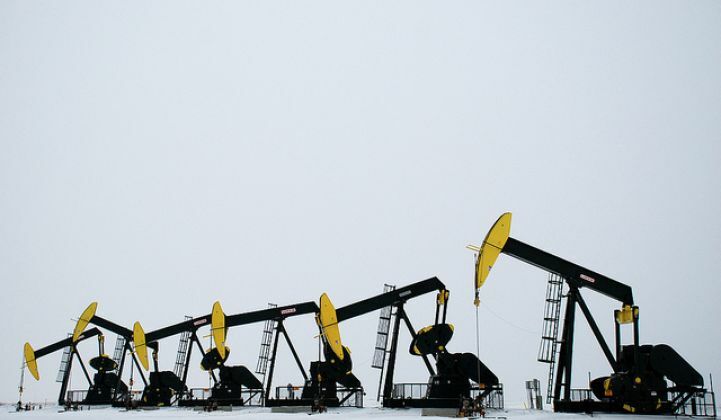 Indeed, the path to connecting the dots started with an observation that many readers have probably already made themselves -- namely, that oil prices seemed to have been notably changeable or volatile over the last decade or so. In the following essay, I describe how I used math tools to dig into oil price volatility -- discovering a repeating pattern of instability in global oil markets that has ticked like clockwork for at least the last 15 years. The identification of this rhythm within the volatile price of oil has taken some of the guesswork out of forecasting what may be ahead. It is my contention that the world has not seen a phenomenon of this type previously and that its emergence marks the rise of a new dynamic with potential to shape our economic and political fate. The uncertainty that many of us feel thus may be far from nebulous, but rather a shared hunch that history’s engines are shifting gears. The water park is family fun on a hot summer's day. My kids are now teenagers, and unlike me, they all swim like fish. But when they were younger, there was one water park attraction that especially unnerved me -- the wave pool. My fear grew from a couple of bad experiences that I’d had early on in this lake-sized stretch of water. Every 10 minutes or so, the wave pool transforms from relative calm to storm-like turbulence. During the calm periods, I’d sometimes be lured into the pool’s deepest parts. But after the wave engine roiled into motion, on more than one occasion I found myself out of my depth in the churning waters and anxious until I could get back to a safe depth where I was able stand with my head above the surface. Recently it occurred to me that the wave pool provides a metaphor for a complex but disquieting phenomenon: every three to four years, volatility in the price of oil surges upward as if spurred by an unseen wave machine. Among the tools used to pick out this cycle of oil price turbulence is the mathematical technique of fast Fourier transform. When the numbers were crunched by this helpful tool, I discovered that since the year 2000, oil price volatility has been oscillating at a period of 1,024 days. Putting this another way, Fourier transformation revealed that wave-like surges of instability in the oil markets have been erupting once every three to four years since the turn of the millennium. It takes a little squinting, but you can make out this repeating, wave-like pattern on the chart above by eyeballing the wriggling red line spanning the years from 1998 to the present, where a rolling three-day standard deviation in daily oil price is plotted to provide a measure of price changeability over time. The tsunami of red spikes centered on 2009 is the most prominent feature of the plot, which I unsubtly arranged to coincide with the wave crashing into tube riders to hammer my point home. 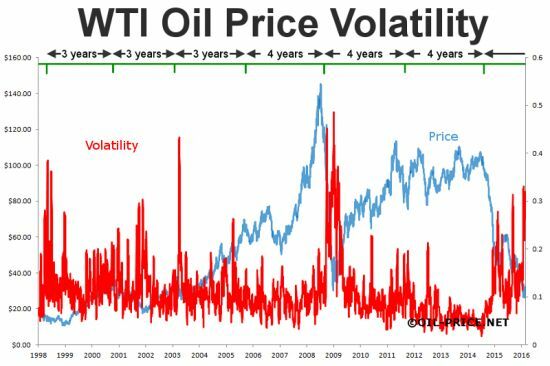 However, there are also clusters of large volatility spikes centered on 2001, 2005, 2011 and 2015 -- the latter of which corresponds to the collapse in oil price that began in mid-2014. In sum, what the chart tells us is that for more the last 15 years or so, the level of changeability in oil price has moved generally upward, with notable bumps punctuating this overall trend every three to four years. Unpredictability in oil price, resulting from rapid changes (up or down) over short time spans, is bad news, because oil, and more broadly fossil fuel, is the commodity that is most essential to the operation of a modern economy and the wealth it generates via commerce. The burning of fossil fuel literally powers nearly all work. Late in 2013, when the oil markets were relatively quiet, I wrote that a significant increase in the level of oil price volatility was due. The basis of this prediction was that it was coming up on three years since the last surge in price variance in 2011 -- the cycle length calculated from the Fourier analysis. On cue, oil prices began their epic decline in mid-2014, accounting for the most recent cluster of large volatility spikes on the “wave pool” chart above. In the wake of the oil price collapse of 2014, in January 2015, as the U.S. economy gathered steam and relative tranquility prevailed in global financial markets, I co-wrote an article with Steve Austin suggesting that stock exchange turmoil was a looming prospect. This prediction was made on the basis of a previously identified relationship in which we had noted that increases in stock market volatility tended to follow oil price variance spikes by six to 12 months. Again, the forecast proved accurate. Mid-2015 saw a sudden collapse in the stock market of the world’s second-largest economy -- China. Unusual levels of turmoil in stock markets around the globe accompanied Chinese market volatility, most especially in Asia, but also in U.S. stock indices. In a U.S. example of this volatile phase, on August 24, 2015, the Dow registered a record drop during intraday trading of over 1,000 points. China and the world’s stock markets have remained twitchy since the mid-2015 spasm. Indeed, there has been further sharp market declines (exceeding 10 percent) in China and elsewhere in the opening days of 2016. The next year may see a calmer situation, but it seems likely that during this period, stock markets could be more than usually sensitive to black-swan-like events. There was another historical event that we were able to point to in our post of January 2015, which suggested that trouble in the equity markets could be on the cards in the near future. This was the Black Monday Crash of October 1987 -- the largest one-day percentage decline ever in the Dow Jones Industrial Average. This unprecedented market tumble followed in the wake of a precipitous 63 percent fall in oil price, which had occurred in the preceding year (1986) due to infighting within OPEC. The Black Monday stock market crash happened nearly 30 years ago, well before the turn of the millennium and the initiation of the distinctive pattern of price variance under discussion here. However, it is related to the present situation in that it may provide a singular example of how a propagating wave of uncertainty sparked by a rapid and unexpected change in oil price may impact and destabilize downstream financial markets. The Chinese obligingly (from our perspective) also dubbed their mid-2015 stock crash Black Monday. This is an interesting historical echo, given that the turmoil in the stock markets in 1987 and 2015 both followed in the wake of major disruptions in the world’s oil markets. The financial media took no notice of the curiously repeated instance of the “Black Mondays.” Their horse blinders remained firmly affixed. The conventional ignorance that emerged was that factors internal to China, such as its economic and political arrangements, wholly accounted for its stock market collapse, with tumult in other equity markets occurring as a knock-on effect. But pointing to China as the basis of all the turmoil is, in our opinion, oversimplifying the cause and effect of the situation. Yes, for the past decade or two, China had more than enough cash juicing around to build innumerable factories, highways, airports, mall and sport arenas. At one point, China was burning as much coal as the rest of the world combined, and gobbling up about half of the world’s aluminum, concrete, steel and copper. That demand, in fact, held up prices and helped countries dependent on exports like Brazil, Australia and Russia prosper. Could the situation remain so? Of course not. We need only leaf back through a few recent pages of U.S. history to see how it played. Following the dot-com bubble burst and during the recession of 2001-2002, the Federal Reserve cut short-term interest rates from 6.5 percent to just 1 percent -- a historic low. As a result, debt became cheaper, people started buying homes at beat-down prices and the economy picked up pace. However, the mortgage debts and derivatives pulled the economy down. The Federal Reserve then put interest rates to near zero in 2008 in attempt to boost the economy and stimulate the moribund housing market. To further speed recovery, the Fed began rescuing banks and pumping money in the form of quantitative easing. What is termed quantitative easing is nothing but the buying of securities at lower interest rates to pump up the economy. The banks were being handed free money and given free rein to invest it. At the peak of the program, the Federal Reserve was dumping $85 billion a month into the global economy through its bond-buying strategy. So, for China, the sea looked calm until the Federal Reserve rethought its quantitative easing largesse at $85 billion a month. But when the trillions dried up, the tale changed. China’s debt-financed strategy of building factories and infrastructure stopped working. Demand fell, the growth rate slumped, and the cost of raw materials dipped. As we know, the price of oil fell too but the cause is varied and not restricted to the China "threat" factor. Taking bets that the future will be like the past and overextending oneself on debt premised on the collateral of a stably priced and ever-growing supply of energy probably seemed like a good idea at the time. But what happens when the price of oil starts to wobble on its own clock and it becomes harder to predict the road ahead? In China and the U.S., the driving forces are likely the same, as is the outcome -- economic disruption. A scientific explanation for what is driving the cycle of wobbles in global oil price -- the wave-generating engine -- remains to be identified. This being said, my view is that it may be a function of the world approaching, or being at the crest of, the oil resource-depletion curve -- otherwise known as peak oil. Before moving on, I want emphasize that I’m not saying we’re in danger of running out of oil. In fact, by any objective standard, there has never been more of the black stuff around. Moreover, our ongoing ability to pump it up in vast, nearly mind-boggling quantities is not likely to change any time soon. There are a number of theoretical and real-world examples of how imbalances in supply and demand at the peak of a resource-depletion curve can give rise to oscillating phenomena. Predator populations, such as those of lions, often show predictable, whipsawing cycles in relation to the numbers of their prey (e.g., antelope). Studies of predator-prey relationships in the wild hint at the complex math -- grounded in chaos theory -- that could give some insight into what may be going on with the present cycling volatility of the price of oil. A predator-prey relationship may be an apt description of the connection between humans and fossil fuels. However, the question arises as to whether the tables have turned, and what now is the biggest threat to whom. The imminent threat, in my opinion, comes from increasingly ferocious instabilities in the world's energy markets. Largely overlooked, but in plain sight for a least the last decade, the wave engine churns on. Based on the established pattern, another surge of volatility in oil prices is set to break over us in three to four years, i.e., sometime between 2018 and 2020. It also has to be said that the cycling three- to four-year pattern of the last 15 years may be breaking down -- it is a function of chaos, after all. What seems less likely to change going forward is that oil prices will be increasingly unpredictable. 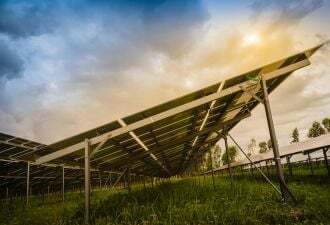 Also unlikely to alter in the near future is the widespread assumption that energy future equals energy past -- a sentiment that will fuel an ongoing cycle of debt-driven bubbles, which will be subsequently punctured by spikes in oil price volatility. Tom Therramus is a medical school professor and researcher who lives in Roanoke, Virginia. He is an American, though is a New Zealander by accent, education and upbringing. Tom has been writing on the oil markets since 2009 at Oil-Price.net.